Hello there, I have been trying to research the best food for value for my 4 month old german shepherd. We have had an awful lot of trouble trying to find a diet to suit her and us! when we first bought her, she was on Arden Grange, which she would eat some days and some not, and for the price, I thought we may be able to find better. So after all the reccomendations, we have tried James Wellbeloved-puppy. she would always eat this, however, after a few weeks she would skip meals and we were encourage by the breeder to add wet food into her diet. When we did this she ate a lot more dry food too as it was mixed with wet food and she would scoff it down. she was now putting weight on, which was the whole point of adding wet food, but it was also not helping her stomach and would come straight back out again. After speaking with the breeder we starved her for 24 hours, and then back on the james wellbeloved alone. 1st time she ate straight away, but now as the days go on she is getting back into the habit of not eating a meal or two a day! which i dont like! yesterday, i added a small amount of steamed carrot mushed up into her food, and she loved it. however, all night and today, she has been having runny toilet again, and this morning has been sick. I took her to the vets who skipped my question so i wondered if you could help me. From an honest point of view, what do you think would be the best food for my dog? I have two other dogs who have been bought up on bakers complete that costs me £5 a week. I understand that to get a much healthier dog inside, you may need to spend £30 a week, but i cannot afford that. Lots of people have said to me well you shouldnt have got another dog, but i believe that you can get a good quality food for cheaper than £30 a week that will feed her happily. Please do you have any suggestions, sorry for giving you an essay to read about my situation, im just so confused what to do now! Comments for What is the best food for value for my 4 month old german shepherd? Best German Shepherd Dog Food??? I would highly suggest a dog food called Royal canin Large Breed. I know it's pricey, but it really does good for GSDs. It has no grains and really has done a wonderful job on my 1 yr old female. She's been on it since we got her at age 8 weeks. This food has done wonders for her skin and coat. 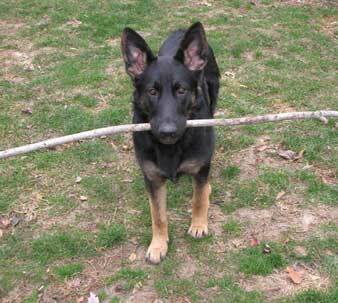 Many gsds's are picky eaters, or suffer form allergies or intolerances. Check the first 5 ingredients on any food. Ideally they should be from a meat source. My pup has a sensitivity to grain, so I switched him to Orijen Large Breed puppy. It is totally grain free & after a four week transition period his stools have firmed right up & his coat is shiny & he does not have the itchies! Check out dogfoodanalysis.com, or dogfoodproject.com. They have many foods listed there & you can see how each one stacks up. When feeding, place the bowl down & pick it up after 15 minutes. If he has eaten it all...great! If not, no food or treats until the next feeding time. Do this for at least a week & you should see some improvement. Adding a very small amount of cooked chicken breast will entice him to eat, but make sure it is only a little bit. Remember, dogs should be lean, you should see a distinct waistline & feel the ribs when you press gently on his sides. GSD's very sensitive to sudden change in their food so first don't introduce changes daily. I find some quality kibble mixed with some chicken meat which we buy the chicken breast weekly, and we cook it up as needed. Make sure to remove fat and bones obviously. Our GSD cannot tolerate any fat, this brings about the cycle you describe of runny stool and or even can bring on potential bloating, panting, etc. So!! The other thing is if picky eater and wanting to maintain or not lose weight, make sure to get a meal in first thing in the morning and make sure to not exercise after eating for one hour (potty outside is fine or just hanging out but not your fast walk, run or any jumping and playing as it can bring about bloat). First meal of day determines that he/she will not have stomach upset due to the bile of an empty stomach, acids etc. If eating grass - can also be due to stomach bile on empty stomach and grass eating can actually become a food disorder similar to people and bulemia! So I discourage grass eating as a rule. I have had great success in eliminating the vomit of stomach bile in mornings due to empty stomach by following this regimen of getting some meal in after early morning walk and bowel movement. While our GSD says he loves the carrots or apples or whatever, his stomach says "no can do". Keeping diet simple and same every day, smaller meals ie 3 to 4 meals and no unusual bone chewable treats (again stomach doesn't tolerate well). Now you could also research the raw food diet but its expensive for some of us. AGain, cooked white meat chicken without fat, added to the kibble seems to be just the thing. It is extra work but great success in not being so picky eater, consistent eating every day and not "going off food" and gain back healthy pounds as before too thin for his frame. Best Wishes!